I did a little imaginary shopping today. Always satisfying. 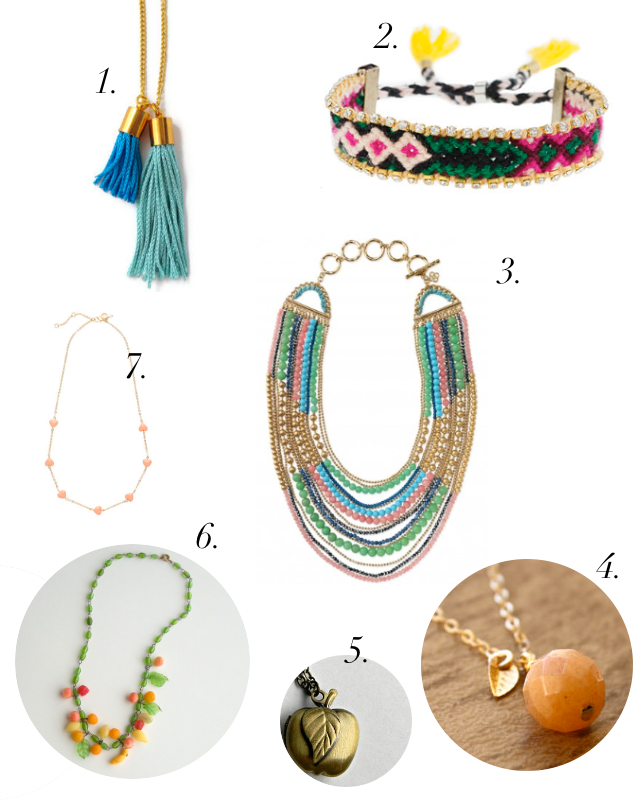 :O) I thought I'd share a few of my favorite jewelry picks for this spring! These all looked like they'd be fairly easy to make, so I might try out a couple of them! I especially love the fruit themed pieces. So fun and fresh! What do you guys think of that trend? Are you into it? Trends are hit or miss for me, but I'm a big fruit fan, so I'm loving this one. I can't afford to go out and buy cutey-fruity things right now, but I can post about them! That's almost as fun. :O) I can totally see Paige in number 6. She'd love that! So, phew! I've been working like crazy you guys. Boy did I pick a doozy for my first book! The way I'm going about things for this book requires a lot of extra work and photography and organization (which is not my forte)...I'm afraid I'm a little over my head. But I know I'll rise to the occasion! And mostly it's been really fun so far, I'm trying to make sure I enjoy every bit of it. I wish I could gush about all the details! I'm also working on several more projects for a magazine that will be out in a couple of months, so that's been really fun. But does it ever seem like when life gets busy it gets really busy? My "real life" has been busier than usual, which makes book writing/blogging tough to fit in sometimes. And I promised myself I wouldn't sacrifice time with my family/church family just to write a book. I can see Paige modeling necklace #6, too.Hang in there with your life. I know your projects and book will be awesome. I love number 4 and 7. Good luck with the book, it must be a ton of work. BTW I love Paige's dimples! I had huge ones when I was little my girls have tiny ones. Pretty pretty! Sorry things have been busy but it's all going to be amazing when you finish!! Excited for you! Can't wait for the book; have you got a title yet? And I totally agree with the busy thing. It seems if there's one big thing coming up, there's a dozen and hardly enough time for any of it. How does that happen?! Anyway, God bless you and all that you take on! Good luck and best wishes! How Sweet are you! Thank you for including Sassy Lemonade in your Fabulous post. Love them all! I love #3....it's most "me." I am super anxious for your book! I'm sure it will be fantastic! !